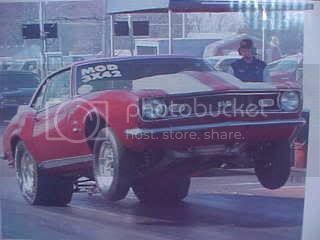 I'm getting ready to buy a 68 camaro and it has a dana 60 rear end on it. What gears should i put in to be able to drive on the hwy and where to buy some? Why would you want a truck rear end in a street car? They are heavy and way more than you need unless you are a SERIOUS racer. I'd look for a 12 bolt or Ford 9" or even a 10 bolt rear (depending on intended use) and put some 3.73 gears in it. Where did this car come from? what did the previous owner use it for? there should be either a TAG on one of the rear cover bolts.. with important info.. or some stamped in info on one of the axles tubes visible from the rear... it will be easily visible.. if its there..
does it have some really LOW gears now??? are you building for fuel economy highway driving.. or a weekend warrior..
there are thousands of different ways to build it..
i sold my 67 camaro decades ago to buy a race prepped 69 that not only had a dana 60.. but ladder bars tubbed and 14/32s on centerlines. i told the guy i sold the 67 to about the car i was going to buy with the money.. he went and found the car and said i sent him.. so he ended up with both..
there are several variations and possibly different ratios from different manufacturers..
My last 68 Camaro had a Dana 60 in it and it held up well under the 632" BB the car had in it. This car also had a full frame, tubbed with ladder bars. The problem with the Dana is the weight, no so much the rear itself but the rotational weight of this rear. In tests I have read a Ford 9" will slow a car almost a 1/2 second over a 7.5" Camaro with the same ratio. So a 9.75 inch Dana will slow your car down even more. Now if you are putting in a big motor, lots o juice or a big blower, then by all means keep the Dana as it is a very strong rear, stronger than a stock Ford 9". If you are putting in a little 350 for street driving by all means sell the big rear to someone who needs it.